I have been a fencer for most of my adult life. I served for about twenty years as coach to the University of Sunderland team before making the transition from 'Olympic' or 'Sport' fencing to historical fencing, which is what I think I always was looking for. Many of the things we did behind closed doors at the university would have been frowned upon by the sport-fencing community, but they're actively encouraged by the historical crowd. I'm not sure when I got my copy of Jared Kirby's translation of The School of Fencing (Domenico Angelo), but I know I've had it for a long time. Techniques from there made more sense when I obtained an actual smallsword, but all the same I recall demonstrating 'that' disarm as an introduction to Session One for many years. Similarly traditional sabre technique made more sense with a fighting-weight blade rather than the sport sabre we had at the time. In short, we were trying to 'do historical' many years before I found out that historical fencing was a thing. The transition was, in retrospect, inevitable. It happened after the university club closed down (mainly due to lack of interest from the university's sport administrators in anything that was not 'mainstream') in 2008. I attended local clubs for the next couple of years but it was time to move on. Sometime in 2010 or so I took a break that might have gone on indefinitely...but probably not. I have started attending Durham Phoenix and Washington fencing clubs from time to time, and the break has helped rekindle my interest. In June 2011, I took up fencing again, this time Historical Fencing with the Society for the Study of Swordsmanship. By my main interest is the Military Sabre and the Smallsword, though I'm also interested in the Backsword, Sidesword and Rapier. Here’s a video of my first foray into backsword-vs-rapier, a few weeks after I started converting from ‘sport’ fencing to ‘historical’ fencing. It’s different. How different, I didn’t fully appreciate at this point. I took my IL1 exam with the Hutton Sabre, a military weapon develop in the 1880s (along with a system for fencing with it) by Captain Alfred Hutton of the King’s Dragoons. Hutton sabre play has much in common with the formal technique underlying modern sport sabre, though with a much heavier blade those parts of the traditional technique that are abandoned by competitive sabreurs become utterly vital to survival. The slightly curved blade is ideal for cutting, but does not make thrusting awkward if running someone through takes your fancy. I’ve also been training with the rapier, and rapier-and-dagger. I find that the rapier suits me much less well than the sabre and the smallsword. Not sure why, and that doesn’t mean that I don’t like the rapier. It just doesn’t fascinate me the way the others do. This is a swept-hilt rapier similar to mine. The blade is too light for ‘hacking’ type cuts; a cut must be drawn or pushed to have any real effect. However, the rapier is not really a cutting sword; that’s just an added capability. Rapier fencing is mainly about obtaining an opportunity to make a thrust. The long blade means that an opponent can be attacked from quite a long measure, ideally keeping the rapier’s user out of reach of a cut. One of the hardest things to get used to with the rapier was using both hands. After years of keeping one hand out of the way, I now have to remember to use it as a parrying weapon. Maybe that’s why smallsword and military sabre suit me better; the body position is more familiar. Anyway, the rapier is a primarily thrusting weapon fought at fairly long measure, with cuts used as a follow-up or opportunistic attack. Leading with a cut invites a thrust which will arrive long before the cut. 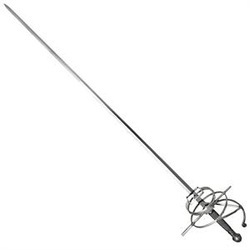 The sidesword is in some ways similar to the rapier, but is fought at much closer measure, with no lunge. The footwork is counter-intuitive until you see how it works, and even then it’s hard to get used to. However, it works well, and it can be applied to some other weapons. This is a sidesword. To some extent it’s a sort of ‘knightly sword’ with the beginnings of a swept hilt to protect the hand. It’s a heavy sword, and seems better suited to long-distance work than the extremely close measure it is actually used at. The key to sidesword play is that the user moves around the sword. Footwork is everything; there are no big parries as such, instead the sword functions as a barrier while the fencer moves behind it. That sounds strange but when you see it, it works. I’ve also fallen in love with the smallsword. This is a light thrusting sword (with no cutting edge) from which the modern foil was developed as a training weapon. Smallsword play in some ways resembles foil, or rather it resembles the traditional, formal body of technique taught to foilists before they learn to flick their way to getting the lights on. Flicks and similar tricks always bugged me; I wanted my foil bouts to be swordplay, not a get-the-light-on-anyhow-you-can contest. The smallsword is the answer to that. It’s a bit stiffer and heavier than a foil, so flicking it is impossible as well as pointless. Stiffer blades, or maybe foil fencing with epee blades, would make sport foil much more like a traditional sword fight, which was what I always wanted. Having competed in the flickfests of the 1990s, against opponents using ‘flickmaster’ blades that could not even support their own weight… well, I moved to epee which wasn’t perfect but at least it had less of that nonsense. The smallsword does differ from foil technique. The hand is held higher and the weight is on the back foot. Much use is made of circular movements to find an open line and close the line that the opponent wishes to thrust in. Hits with the ‘edge’ are pointless (no pun intended; really!) but it is possible to bash your opponent in the head with the hilt if you get close enough. Normally you’d get run through trying something like that, but a lot can happen in a sword fight and sometimes distance just evaporates. The smallsword was as much a fashion accessory as a practical weapon, but it could be lethal in the right hands. Interestingly, smallswords are permitted in some historical sabre competitions, and both bodies of technique include ways of dealing with the other. This is perhaps because the weapons are contemporaries, and some military officers would wear a smallsword for dress (and might have to fight with it) while using a heavier and arguably more practical sword for combat. Whatever the reason, it’s an interesting matchup. A properly educated swordsman should know how to wrestle, of course. Fights do go to close quarters at times, and knowing how to cope if someone grabs your sword arm or you are disarmed can be a vital skill. There are also specific disarms for occasions where it is not desirable to kill your opponent... or you want to murder him more easily. Much of the traditional body of European wrestling and grappling technique was developed for the battlefield or as an adjunct to swordsmanship. This is readily apparent if you study both.